Google My Business is an important tool to utilize for SEO. While a well-optimized listing can drive SEO results for local businesses in particular, national and global companies can also see keyword ranking gains and website traffic increases with Google My Business. It’s an SEO best practice for all businesses to ensure your listing is optimized and up to date. Google My Business is a free tool which allows you to manage your company’s appearance across Google, including Google Maps and Google’s search engine results. As mentioned previously, Google My Business can make a large impact on a local SEO campaign. The “Local Pack” found in Google’s organic results when searching for locally-focused keywords populates with companies that have Google My Business profiles. Often times, the local pack will appear before the organic search results, giving you an opportunity to appear further up in search engine results. 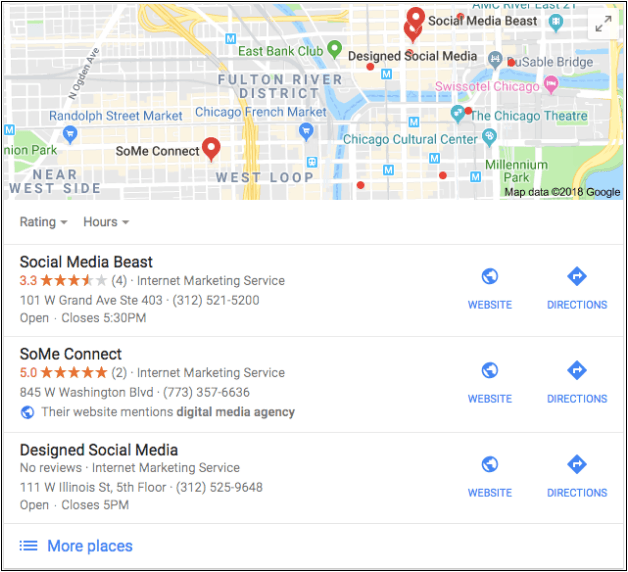 Beyond local pack rankings, publishing and maintaining a Google My Business page sends additional signals to Google between your company and its location. This can enhance the keyword association Google’s bots make between your company and a geographic region, which can move your website further up in organic search results for relevant and locally-focused search queries. There are additional benefits of using a Google My Business page that aren’t directly tied to SEO. For example, the platform reports on analytics pertaining to your listing (customer actions, search queries, photo views, etc…), allows you to respond to user reviews, publish new photos, and more. 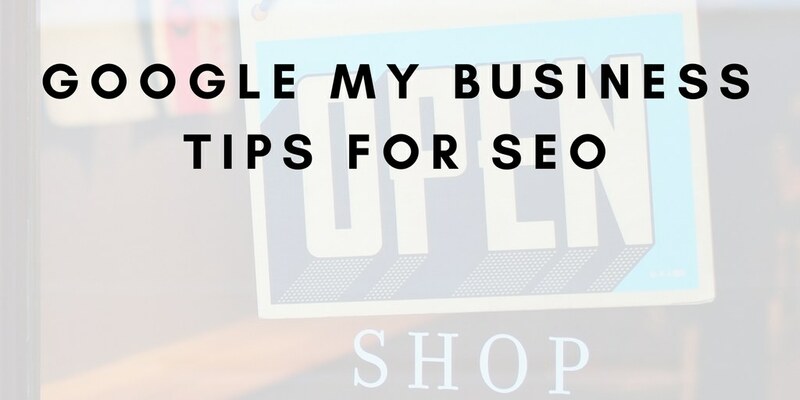 Overall, using Google My Business has important SEO benefits as well as reporting insights, customer engagement functionalities, and much more. The first step to using Google My Business is setting up and/or claiming a profile for your business. You can do this by visiting https://business.google.com/ and searching for your business. Your business may already exist in the system, in which case you will need to “claim” it. Otherwise, you will add your listing as a new company. You will be prompted to enter your company’s information through the next several steps, such as address, business category, website, and more. After all of this information has been entered, you will need to “verify” your business. The verification process includes Google sending a postcard to your business address. This postcard will contain a code that you will need to verify your business. Google essentially wants to be sure that a legitimate company is being added to Google My Business, and receiving mail to a physical address is an effective way to weed out fake or spammy business submissions. Sometimes Google will make an exception and allow you to verify your business by phone. This offer is typically extended to businesses with several locations/franchises. Call a Google My Business representative to see if this option is available to you. What if Someone Else has Claimed my Business? If your company already has a Google My Business profile, you will need to clear an extra hurdle before you can start managing your listing. The current owner of your listing will need to grant you access. A request for access can be sent through Google My Business. If the current owner denies your request, you may have the option to appeal the denial. If the current owner is unresponsive for a week or more, you may have the option to simply claim the business listing without approval from the current owner. More information on requesting ownership of a business that has already been claimed can be found here. Accurate & complete profile: This may seem like a no-brainer, but be sure to provide as much information about your business as possible. 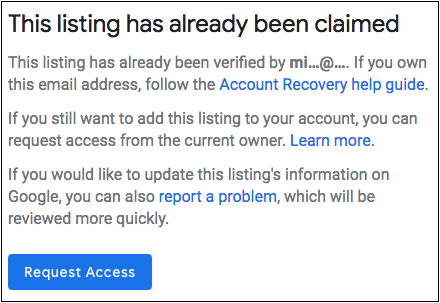 You want to leave as few fields blank as possible to increase the perceived legitimacy of your profile not only to Google, but also to users. In the same vein, ensuring your listing information is accurate and consistent is crucial. You may have heard of the importance of “NAP consistency” before, and the same logic applies to Google My Business. If your website lists a different address than your Google listing, one of the two needs to be updated for consistency. 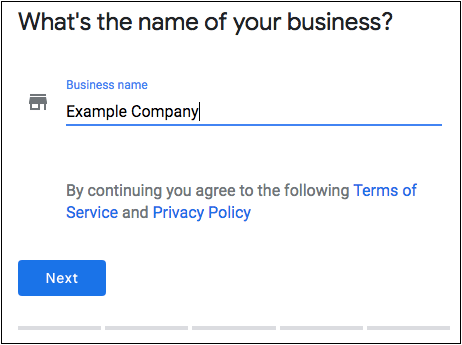 The same goes with your phone number and business name appearance (don’t list yourself as “Example Company Inc.” your website displays “Example Company” on your website). While it is important to ensure the primary category most accurately describes your business, supplementing it with related additional categories should never be overlooked. Your primary and additional categories send signals to the Google bots on the types of keywords to associate with your company. In the screenshot above, we use these categories to tell Google “Not only are we an internet marketing services company, we’re also a marketing and consulting agency.” Capitalize on your keyword ranking opportunities with business category listings. Reviews: Reviews are the most valuable functions offered by Google My Business. As seen in this study from 2017, reviews play a significant role in determining where you rank in Google’s local pack. The more positive and diverse your reviews, the better you can expect your local pack positions to be. You should try to acquire as many positive Google reviews as possible. Reach out to past and current clients/partners and ask for reviews. Also be sure to respond to negative reviews in a professional manner – this will enhance your company’s credibility with both Google and users. Posts: Google Posts is a more recent addition to Google My Business having launched in the summer of 2017. This function allows you to highlight promotional offers, events, specific products, and more. With functions like featured snippets, answer boxes, knowledge panels, etc… receiving more engagement, users may be less inclined to click through to websites when Google offers so much information within their search results pages. Google posts enhances your ability to expose users to important information without visiting your website. 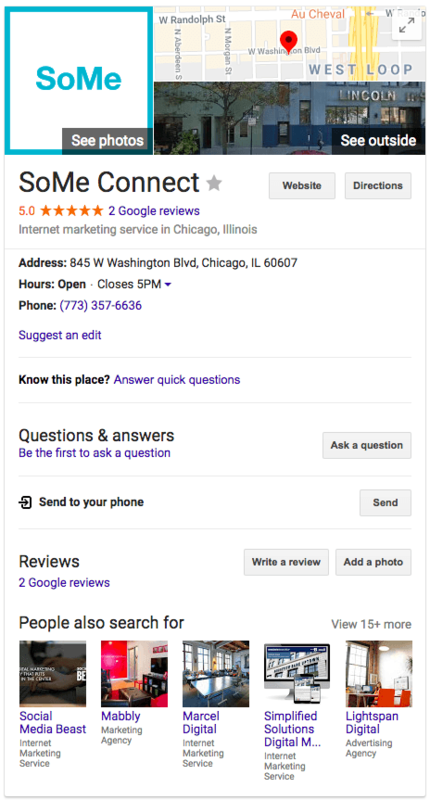 Optimizing and maintaining a Google My Business profile is an SEO best practice. The local pack and organic ranking benefits are well worth the time investment, and the additional customer engagement functionalities and analytics data further sweeten the deal. A complete local SEO campaign involves much more than Google My Business. Contact us to learn how we can help your local rankings.